ConAgra's headquarters in Omaha will soon be moving to Chicago. 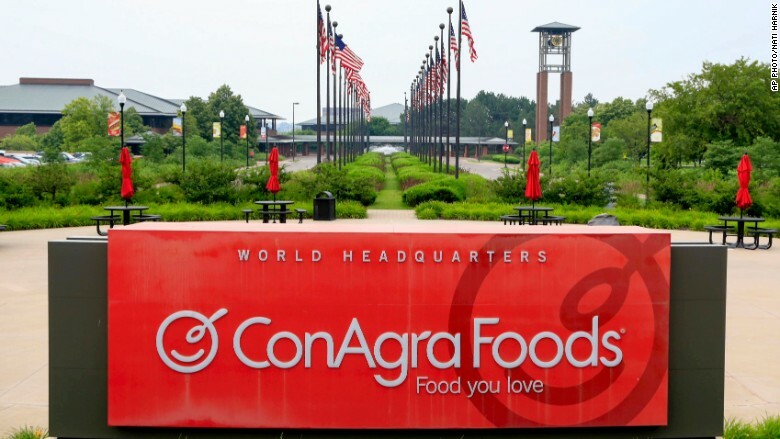 ConAgra (CAG) said Thursday that the layoffs will affect workers in the company's corporate offices worldwide and not at any of its food production plants. ConAgra joins a growing list of blue chip companies that have announced layoffs in recent months, including Kraft Heinz (KHC), Hewlett-Packard (HPQ), Caterpillar (CAT), Halliburton (HAL), Whole Foods (WFM) and Microsoft (MSFT). But the company's move to Chicago is also a big blow to the Cornhusker State. The city still is home to several other giant corporations such as insurer Mutual of Omaha, railroad Union Pacific (UNP) and, of course, Warren Buffett's Berkshire Hathaway (BRKB). Berkshire Hathaway is also a big player in the food business, thanks to its large stake in Kraft Heinz and ownership of Dairy Queen and See's Candies. Warren Buffett's son Howard also once served on ConAgra's board of directors. ConAgra CEO Sean Connolly said in a statement that the company will "retain a major presence in Omaha, where we have deep roots," but added that the company was making "difficult" and "necessary" decisions to help boost productivity and profits. Chicago Mayor Rahm Emanuel said in a statement that "this decision by ConAgra Foods further solidifies Chicago's role as one of the world's leading destinations for food processing companies."